There's still a pretty big demand for carbs, not only in the racing world, but also in customization and rebuilds. A lot of car guys are okay with losing stock equipment for newer chromed stuff, but computers are still seen as sacrilege. Plus there's also heavy demand in places where reliability and ease of repair are valued over performance and fuel economy. When you're 100 miles from the nearest town and your engine takes a dive, you stand a much better chance of getting that carb rigged up enough to get going again than you do if an electronic system goes down. Anyone want to guess what they were on? An in line six or maybe a flathead? Definitely not an inline 6. Not sure of the cylinder head configuration. 6PM reveal if no one comes up with it! I'm picturing an old open wheel car. Perhaps a Ford Cortina powered formula Ford? I think this thread turned out quite interesting. however: Sure caburetors are still around, but for an industry, it must still have been a huge change from a time when EVERY car produced had at least one carburetor, to just about a decade later, and it was a specialty product. 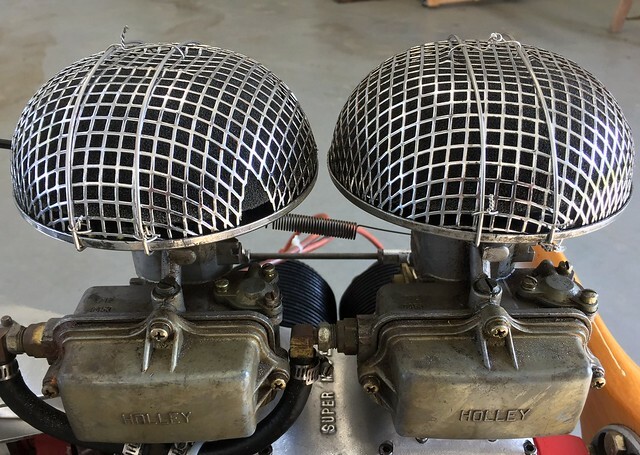 We had a fly-in yesterday and those carbs reminded me of this thread. I thought the little portion of the wood propeller might give it away. I guess not! Last edited by Fast Eddie B; 21st May 2017 at 04:00 PM. I thought the propeller was part of a frame. I'm guessing the two Holleys are more for redundancy than performance. I thought the little portion of the wood propellor might give it away. I guess not! Are carbs standard on those birds? Carbs don't do well with steep inclines for more than a second or two - one of the reasons I put TBI on my off-road truck. It would cough and sputter when inching along a 45 degree-ish pitch left to right. That'd be kinda scary when flying! But they do need to be flexible enough to deal with slips and skids. Do autogyros behave the same, though? Pretty sure. It's still a "wing", albeit a rotary one. I saw the prop and recognized it as such. But the engine seemed small for an airplane, so I wondered if it wasn't something like an airboat. Didn't consider autogyro. Thanks for posting that. It reminds me of the Starrett factory in that they have a mix of very old equipment and new equipment. The amount of hand-work in that video is pretty clear demonstration of why those are no longer used in production cars. Then again, that kind of carb never really was. Quite a lovely video. Nice article. A lot of thought went into the design of all those jigs and weldments. I don't suppose many new carburetors are being designed these days but once upon a time some toolmakers really earned their keep. ..... no longer used in production cars. Then again, that kind of carb never really was. Quite a lovely video. Except for Ford hi-po 390, 427,428,429,460... And my favorite, the Mercury 410. In fact, I still have the Holley off the 67 410 that I put into my 72 F250. It has a Motorcraft part number stamped in it, starts with C7. The cam I ran was a C6OZ 6250-BB, 428 Cobrajet cam. You've got me and Google stumped. Now a "Q car" I know. One lives next door- Galaxie 7.0, last year of the 428. Factory Holley. And on the other side a 68 Riviera 430, so also 7.0. Quadajet on that one. I remember when Carter Carburetor was a major employer here in St. Louis. At the time, we had plants for all the major US car manufacturers, and Carter churned out carbs for all of them. I remember that there were something on the order of 40 external adjustments on these carbs to keep them running right... So naturally ours seldom did. I have fond memories of being able to buy a “rebuild kit” for a standard carb that cost about 2 bucks. You're overthinking it. "YW Galaxie" = "You're welcome, Galaxie." Ha ha, yes. In fairness to casebro, it took me a second to get it, too. "Galaxie" is a trade mark for a Ford car. You having left out the comma in a thread about injection vs carb, made me think you were talking about an injected Ford muscle car. I was expecting "Car talk" rather than "Leet speak". Please tell me that the Countach(upthread) with the V-8 has, at least, a bit of a snarl. what the hell happened to steam engine manufacturers? I believe Rockwell is dominating the market now. That schtick was first done in the 50s for the Chrysler Torqueflite automatic transmission. I though maybe soembosy had dug it up. Autoparts would have been more appropriate. I had a friend who rebuilt his VW Bug carb and was left at the end with "extra parts." It still ran ok so he proposed that if he rebuilt his carb enough times he could turn it into two functioning carbs. Technically, if he rebuilt his carb with a rebuild kit he would have "extra parts" at the end. These were parts not in the rebuild kit. If I remember correctly small washers and small springs dominated. I seem to recall that every little machine screw holding the top down had a washer on it, and those were often left out, and there was a little spring on the accelerator pump shaft to speed its return when it was opened up and let go, as well as a spring on the idle jet needle to keep it from going out of adjustment. You could likely get away with leaving them all out but a missing idle screw spring would cause problems down the road. Nonsense! "Idle" is the enemy of the good! *I just noticed that the pipes aren't tuned so maybe not a two-stroke. Last edited by Elagabalus; 25th September 2018 at 02:21 PM. Rebuilding carbs wasn't terribly difficult. You just took it apart, cleaned anything that had crud or varnish on it, and put it back together, replacing the stuff that was in the rebuild kit (mostly gaskets, o-rings and the valve that the float shut off). There were a lot of small parts that you had to be careful not to lose or leave out when reassembling. If you had parts left over, you probably messed up somewhere.